Let me just start with this, I think I might be in the 8 week slump or something. My brain and body are kinda working in different directions, not in a bad way just weird. So when I ramble tonight just stick with me. This morning I was really not feeling my workout. I wanted to stay in bed forever. Bed wasnt an option this morning because I had to get in two today and I knew I was never going to get to swim at lunch cause this is our busiest time of the month so I just had to deal with it. I got up and got on my most motivating shirt....you know I would have one of these for every single day if they werent $30 a piece!!! Once the coffee started brewing I kinda woke up and the shirt just put me over the top! I was ready. I got to the gym for spin class and the guy this morning thought it would be a great idea to climb for the entire hour. I never say this but I was really hoping for a sprint or two. Once I finished my spin class I needed an elliptical break. I got 30 minutes in and then off to the aerobics room. It was time for 52 card pickup again. This week I really focused on cardio and less strength. I did box jumps, burpees, sprints, and pushups...and it was brutal. The sprint was the hardest part of the whole thing. It wasn't far or fast but they were just killer. It took a 25 minute to a 45 minute workout. AND IT WAS AMAZING! This week I have had some killer workouts. Heres the mind dilemma! I have had a great workout week but every second I am tempted by food. Im just in a bit of a diet slump but on a workout high. My workout went a little long since I added those sprints. I just knew I was going to be late to work but I actually got there earlier than normal. And wouldn't you know it but the phone system was still down. This was the third day in a row and I wanted my phone back. I was using my cell again to get the essentials done and then right around lunch time we got phones back and I got really productive! 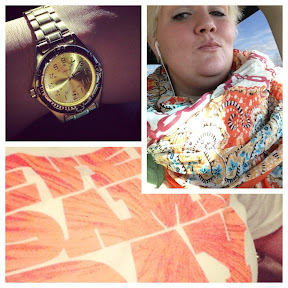 You have to check out my collage of FatGirl Fashion....it was a strange day. I was a little late leaving the office tonight but I cant complain cause it could be so much worse. I had a huge to do list tonight. I had to go to the grocery or not eat tomorrow, I had to take the garbage out at the office building that I clean, I had to bake a cake, and eat, and get in a second workout, and get all those things done before 9:30pm. As you can imagine that did not happen. I had to prioritize a little bit but I got my entire list done except the cake, looks like Ill just stay up a little later tomorrow night and do some baking. The positive side to that is I can eat a little bit of the batter and maybe get out of the food slump. 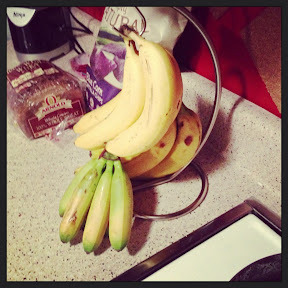 I got the groceries...Can you have too many bananas?!?!? 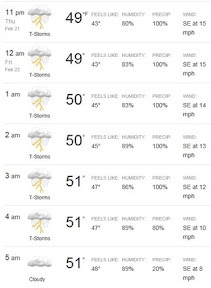 Looks like it will stop raining just in time to get to the gym in the morning. Since the rain messed me up I had to do a garage workout tonight. 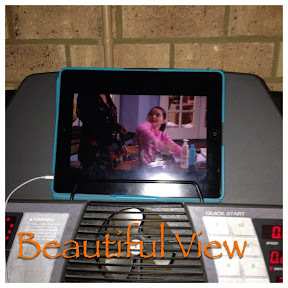 It was a 20 minute run on the treadmill at my eventual race pace, 6.0 mph. I definately got my sweat on and even thought it was short it was pretty nice. I had to take some braeks to get my breath but was happy that I could keep that pace as long as I could. Now that the 2nd workout is in the books its time to start winding down. 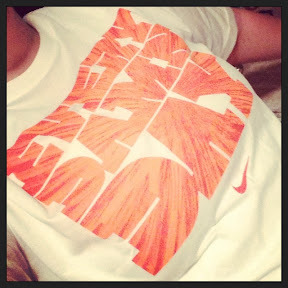 This is the slight down side to such a late workout, its kinda hard to go to bed cause Im kinda geared up. But Im glad I got my run in. To be honest Im glad that I am pushing myself this hard, Im glad that I chose to be totally committed to this diet plan and this huge goal of 65 pounds. Even on days (or weeks) like today when things get a little tough I just have to keep reminding myself that "I CHOSE THIS! I WANTED TO LOSE THIS WEIGHT! I WANTED TO GET 2-3 WORKOUTS A DAY! I CHOSE THIS!!!!!" Thanks for listening to my rambling tonight...sometimes I just need to complain a bit, brag a bit, and just try to get my thoughts together. I'm amazed at your mental toughness. You are putting in the work, and I can see results. Way to hang in there and stick to your goals!